Harold was born in Denver, CO and when he was 17 he and his best friend lied about their ages and joined the Army. During WWI he was in Company E 115th Engineers 40th Division and they were sent to France in 1917. His outfit fought in the battle at Chateau Thierry in 1918 and also in the Argonne Forest. They traveled through many small towns. In one, they stayed in a destroyed home, found potatoes in the root cellar, lard in a cupboard and used a lace curtain and a pot to make French fries over the fire in the fireplace. In the 1960's Harold and his wife made a trip to France. He had drawn maps during wartime and actually visited a family on the same original street. They met several family members from the house. Their college-aged son spoke English so he was able to translate. They were invited in for coffee and shared stories. The family was so intrigued with Harold's story of the French fries. After his service in WWI, Harold and his wife were living in Los Angeles, CA. At the outbreak of WWII in 1941, with the bombing of Pearl Harbor, Harold reinlisted. 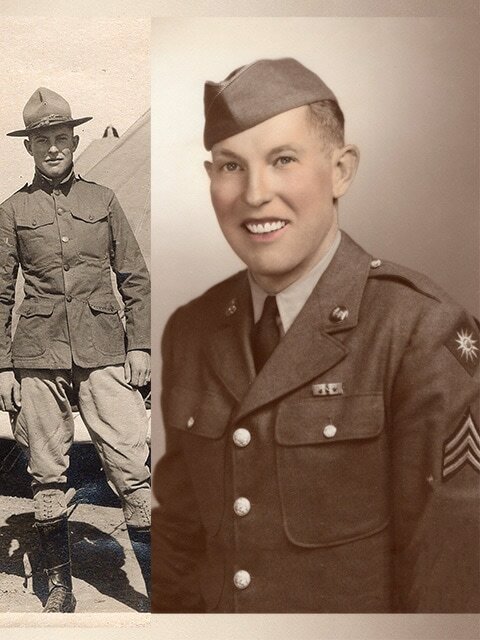 He was sent to Camp San Luis Obispo for training again as a member of Company E, 115th Engineers, 40th Division. They were, after rapid training, sent to Hawaii to clean up Scofield Barracks and the surrounding area following the bombing. They worked long hours and Harold was a Mess Sergeant helping to feed hundreds of troops. He said he never knew he'd have to order so much catsup. It took many months to clear debris and construct new structures in and around Pearl Harbor and Hickam Field. After he was discharged in 1944, he became a Veteran's Service Officer in Crescent City, California helping returning veterans get their benefits. After five years, the family moved to Long Beach, then eventually to Lakewood. Harold and Ethel had a daughter who later gave them a grandson. Their daughter and grandson are both Lakewood residents. Harold and his wife, Ethel purchased a home in Lakewood in 1964. They were married for 49 years. Harold worked for McDonnell Douglas Aircraft as a Transportation Engineer. He remained a Lakewood resident the rest of his life.